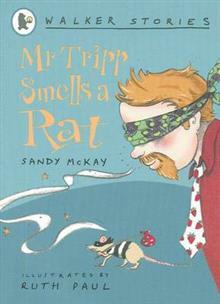 Join Mr Tripp and Room Five for three great stories about an escaped rat, a surprise birthday party and an itchy insect invasion. Room Five's teacher, Mr Tripp, is good at telling jokes, loves riddles and is great at using his nose. When a student's pet rat escapes from its cage, it's up to Mr Tripp to be brave, and to smell it out! Three fun and engaging stories which will have early readers eagerly turning the page for more adventures. Sandy McKay's first novel Recycled the New Zealand Post Children's Book Award for Junior Fiction in 2002. She has since had three other titles appear on the Notable list for the same award: My Dad, the All Black, 2002; Who Wants to be a Millionaire?, 2005; Losing It, 2008. Ruth Paul's title The King's Bubbles won the Children's Choice Award, New Zealand Post Children's Book Awards, 2008; and the Children's Book Design Award, Book Publishers Association of New Zealand Design Awards, 2008.